LANSING, February 22, 2018 — Rey Guzman, economic/community development specialist with the Michigan Talent Investment Agency (TIA) Industry Engagement Division, has been named a 2018 Michigan Works! Impact Award Winner. The annual Impact Awards recognize significant economic accomplishments within Michigan communities and showcase the impact of newly-created jobs, transformational training and effective talent development. The awards were presented at a ceremony on February 21, 2018 at the Anderson House Office Building in Lansing, MI. Guzman was nominated by Michigan Works! 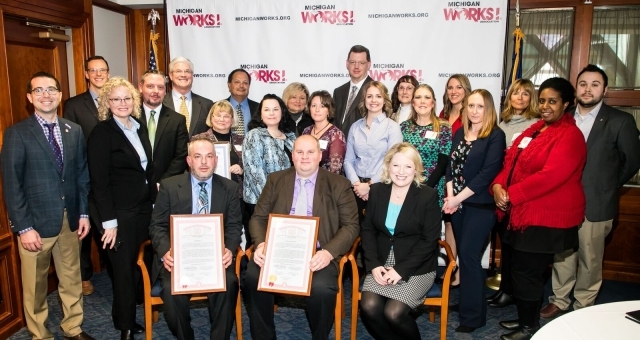 Southwest for strategic partnership and collaboration to customize local strategies for training and employment opportunities, specifically related to the work he did on the Clemens Food Group project. In 2014, Clemens Food Group, a Pennsylvania-based, family-owned, integrated pork production operation, was considering Midwest expansion in either Michigan or Ohio. They eventually chose Coldwater, MI as the site for a new plant, based upon support from both the state and community, as well as site feasibility and labor force preparedness. Guzman was able to forge a strong partnership between TIA, the Michigan Department of Agriculture and Rural Development (MDARD), the Michigan Economic Development Corporation (MEDC) and local municipalities, who, in turn, worked closely with the Clemens leadership team to develop hiring strategies and training opportunities that would best fit the employers’ needs. To learn more about the Clemens Food Group project, watch the video. To learn more about Michigan Works!, visit their website.